Overall print size: 16" x 25"
In a strange quirk of fate, a Sunderland of 461 Sqn RAAF identification letter U, destroys submarine U-461, a type XIV tanker, one of three German submarines caught on the surface by Allied aircraft in the Bay of Biscay on July 30, 1943. At extreme low level, Sunderland 'U' braves a barrage of gunfire from all three encircling German submarines to deliver a successful depth charge attack, sinking U-461 in a single pass. 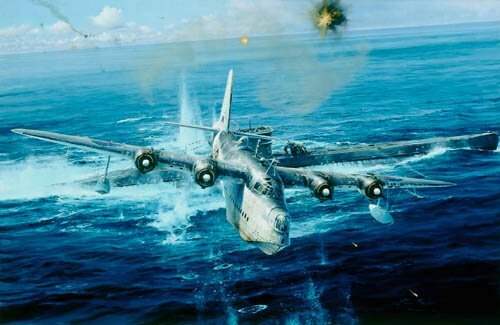 In an act of grace, the Sunderland pilot returned to the scene to drop a dingy to the U-boat survivors. Surviving crew members of Sunderland U-461 and U-Boat U-461, have signed the edition.